Sustainable, efficient, resilient facility operations can seem like a distant ideal, but can be achieved with vision, a strategy, and disciplined implementation. A holistic asset management strategy begins with knowing what existing spaces, assets, people, and operations fall under your umbrella of responsibility to maintain. Depending on their application, assets each serve a different purpose. Understanding this purpose is paramount to successful facility management. Defining what a facility manager does can be difficult as it is often subjective as it is rarely outlined clearly in a job description. Because FMs report to building owners as well as occupants, their job descriptions can take on multiple interpretations. One indisputable aspect of the role of an FM is the stewardship of facilities and, more specifically, the maintenance of a collective of assets. High-performing facility managers show stewardship by defining successful operations. This can be done by establishing a workforce that works continually toward understand what they have and how to maintain it in the context of the organization and its daily operations. A complete asset inventory is the ideal, but even a simple count of larger assets can be a good start. Inventorying can be a time-intensive and costly effort, but one that can prove invaluable to future operational needs. Involving contractors and service providers by requiring they conduct regular and accurate asset inventories can be one way to lessen the burden. A thorough asset inventory can be a significant effort for a large campus or portfolio of buildings and it may be a good idea to get help from an external resource. An up-to-date asset inventory can feed many other initiatives. With a complete data set, it is easier to frame the structure of future facility condition assessments and define capital replacement needs. Other ways to use an asset inventory include establishing a Preventive Maintenance (PM) Program and populating Computer-aided Facility Management (CAFM) software such as Computerized Maintenance Management Systems (CMMS) and Integrated Workplace Management Systems (IWMS). Sustainable, resilient facilities not only collect but also maintain a comprehensive asset inventory. It is common practice to inventory only fixed assets, while some operations inventory process equipment not operated or maintained by facility management. You may already have an asset inventory, but is it time to revisit it? It is best practice to complete a comprehensive inventory of all assets every five years, while revisiting aging assets and critical equipment every year. It is best practice to use a standard nomenclature, such as Uniformat II or OmniClass, to classify and organize assets in the inventory. It is difficult to understand assets without the ability to distinguish between them. Personalizing each one by giving it a name—or, rather, a number or barcode—is a sure way to individualize. Common elements of an asset inventory include: name or other identifier, classification, location, manufacturer, make, model number, serial number, size, purpose or what it serves, maintenance costs, warranty information, service numbers, and the like. Critical to the inventory strategy is envisioning the end from the beginning—in particular, it can be important to know, before you begin, which asset types or what asset criteria will be useful in related efforts such as preventive maintenance plans, condition assessments, and capital needs analyses. Resilient and efficient facility operations require a comprehensive paradigm. A strategic approach to an asset inventory effort can save you time and rework in the long run. There are many different options and strategies to consider before undertaking an asset inventory. The bottom line is that an accurate asset inventory, no matter how it is acquired, is essential to comprehensive facility stewardship. Facility Condition Assessments (FCAs) are critical to the overall health of a mature facilities operation. Think of an FCA like a physical performed at a doctor’s office. It requires a detailed checkup of the facilities and assets to determine current condition based on deficiencies. The outcomes of an FCA can be multifaceted; they can inform you of conditions and prioritization of needed repairs but also predict timing of capital renewal needs. Outlining the interconnectivity of individual assets can be done by categorizing the asset inventory into distinct systems—consider using the same classification as the asset inventory. To take this further, consider defining parent-child relationships of assets within systems. Systems-based condition assessments address conditions of entire systems (e.g. Central Plant Heating) instead of by individual component (e.g. Boilers). A systems-based approach can save significant time and money by giving a broader overview of facility condition for facility management decision-making. Condition rating. Many options are available, but consistency is most important. Remaining Useful Life (RUL) as determined by current condition and lifecycle expectation. This will be particularly useful in capital planning efforts. Immediate issues including poor maintenance conditions or effects to operability or access. Pictures, as they make for better arguments in the board room. It is important to remember that asset conditions do not remain stagnant and that an FCA is only a timestamp of condition. It is best practice to complete a comprehensive FCAs every five years, while revisiting aging assets and critical equipment intermittently. Current asset conditions are best observed over time and require more than a one-time report. A complete and accurate asset inventory and FCA is integral to a comprehensive maintenance strategy—all concepts of high-performing facility operations. One approach is to standardize maintenance approaches by equipment type. For example, large and expensive assets that are not easily replaced such as air handler units will be maintained through their design life while small and inexpensive assets, such as electrical receptacles, will be run to failure as they are less costly to replace than to maintain. 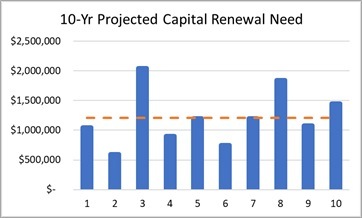 The level of detail in asset inventories and condition assessments will influence the accuracy of capital renewal forecasting. Assessing condition of existing assets is a critical element of sustainable, efficient, resilient facility operations and requires a system to house and manage data to fit your organizational objectives and operations. There are many software platforms that can accommodate data accumulated from asset inventories and condition assessments. Without proper data management strategy, systems won’t retain their value to operations and can quickly become more of a burden than a tool. Systems are only as good as the data within them. Technology can make your data work for you, but which platform or package is the best fit for your operations? Will you need a CMMS or IWMS? Taking the time to define the need for such a platform will best prepare you choose a software thoughtfully. Consider involving different departments in the selection process as the implementation may impact their operations by their need to interact with it. Ultimately, select a platform that will best leverage its capabilities and minimize its limitations to your organization’s needs and existing operations. Effectively implemented technology requires an input of data—all of which will need to be maintained to prove useful. Software won’t solve all problems. Regardless of what data system is used, it is essential to continually track assets, perform adequate asset maintenance and monitor asset conditions recurrently. Informing and engaging leadership in this process can calibrate service expectations, prevent a few surprises, and will prove active stewardship of the facilities you manage. A strategic, holistic approach to high-performing facility and asset management operations incorporates asset inventories and condition assessments as a means to understand the breadth and depth of a facility manager’s responsibilities. An asset inventory is essential to comprehensive facility stewardship as it is difficult to maintain your assets if you don’t know what you have. Assessing condition of existing assets is a critical element of sustainable, efficient, resilient facility operations and requires a data system that fits your organizational objectives and operations. Stephen Clawson, FMP is a facility management consultant at Facility Engineering Associates, P.C (FEA) where he performs evaluations of existing facilities including condition and organizational assessments and conducts facility data analysis and research for various clients. He is a Facility Management Professional and a graduate of Brigham Young University where he majored in Construction and Facility Management. Stephen uses his wide-ranging industry exposure to offer creative solutions to clients in all facility types and industries with varying organizational structures and missions.